From Mirko Tabori. 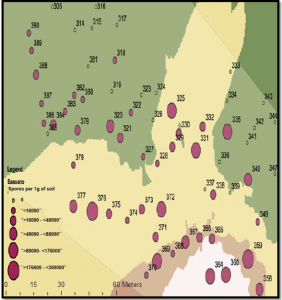 Interpolation analysis of Plasmodiophora brassicae resting spore concentration and location for 95 soil samples collected in a field near Bassano, Alberta. Note that the highest resting spore concentrations are found in the southeast portion of the field, which corresponds to the field entrance.